One of the best season to visit Japan is during autumn. Not only will you enjoy the pleasant and cooler temperatures after the hot summer, trees along the entire length of Japan will gradually start to change color, painting the landscape in beautiful hues of green, yellow and red. Painters and poets have been, since ancient times, inspired by the autumn for centuries as the scenery turns into a mesmerising real-life painting, so beautiful, it’s not hard to understand why. Autumn leaves are called ‘koyo’ or ‘momiji’ in Japanese, and will start to show their changing colors from mid-September to November. We’ve selected the 10 most beautiful places to see autumn leaves in Japan that will leave you in awe! Located next to the Kawamata Dam, Setoaikyo Canyon was formed by erosion due to the Kinugawa River. The almost vertical cliffs measure 100 meters and are covered densely by trees and shrubs. During the autumn, vivid greens, yellows and reds burst from every nook and cranny creating a stunning backdrop of colors. The best spots to take in the vista is from the observation deck, and for those who are daring, at the middle of the suspension bridge. At the base of Mount Fuji at an elevation of 1,000 meters in Yamanashi prefecture you’ll find the Fuji Five Lakes. Of all the five lakes, Lake Kawaguchi is the most famous and is often featured in pictures and advertising. What sets this place apart from other other autumn leaf viewing spots is the iconic Mount Fuji looking over the lakes at its backdrop. 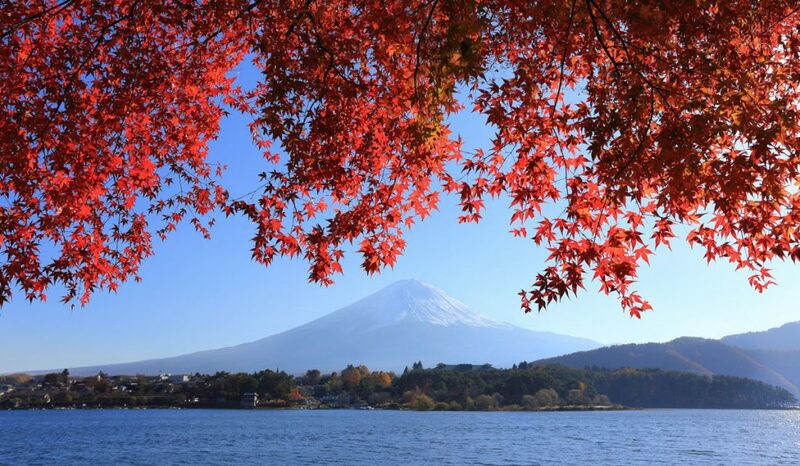 As the maple leaves turn red, it creates a picture perfect frame around Mount Fuji. 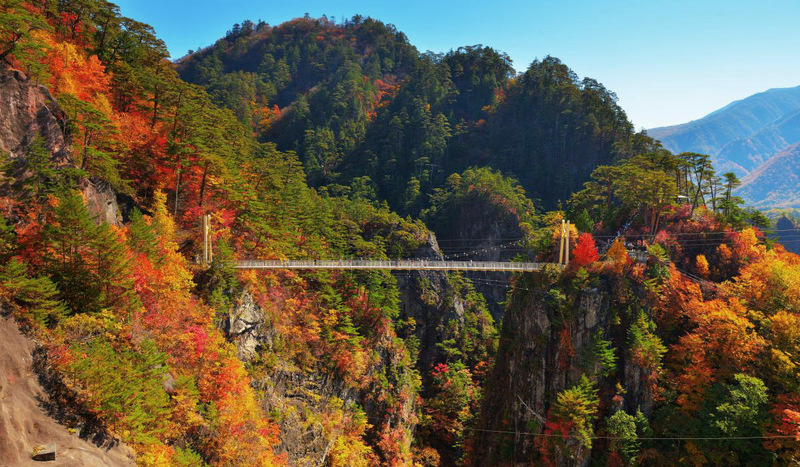 Although less known than other famous autumn leaf viewing spots, Nishizawa Gorge is one of the most beautiful hidden treasures in the Kanto region still relatively free from mass tourism. Along the hiking trail that leads through the forest you’ll see many waterfalls and mountain streams but the absolute highlight is the 5-tiered Nanatsugama Godan waterfall. The thick forested area turns wonderfully yellow and red and creates a striking contrast against the cool emerald waters of the falls. At a length of 5,481 meters long, the Dragondola, officially known as the Naeba-Tashiro Gondola, is the longest gondola lift in the world. 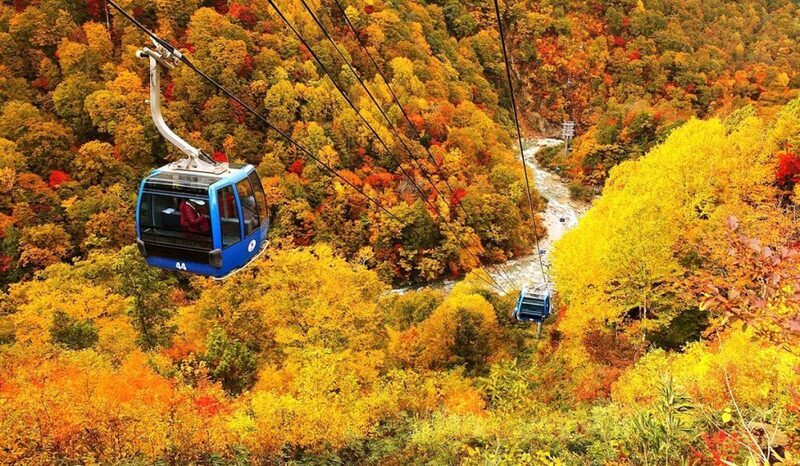 Carrying a maximum of 8 passengers at 230 meters high, viewers can enjoy the changing autumn leaf colors from above. Glide over the highlands mountains and witness the view expanding and changing below your feet. 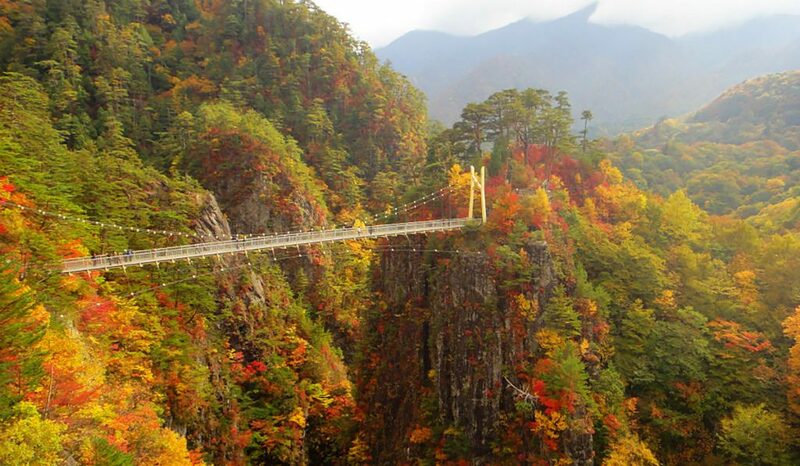 This is one of the most spectacular ways to view ‘koyo’ in Japan. Not far from the city center of Kyoto the west, you’ll find Arashiyama at the base of the Arashiyama Mountains. Along the river running through Arashiyama, you’ll find many attractions, such as the Monkey Park Iwatayama and the famous Arashiyama Bamboo Groves. When autumn comes, the foliage covering the mountains form bouquets of color and are best enjoyed from across the river banks. 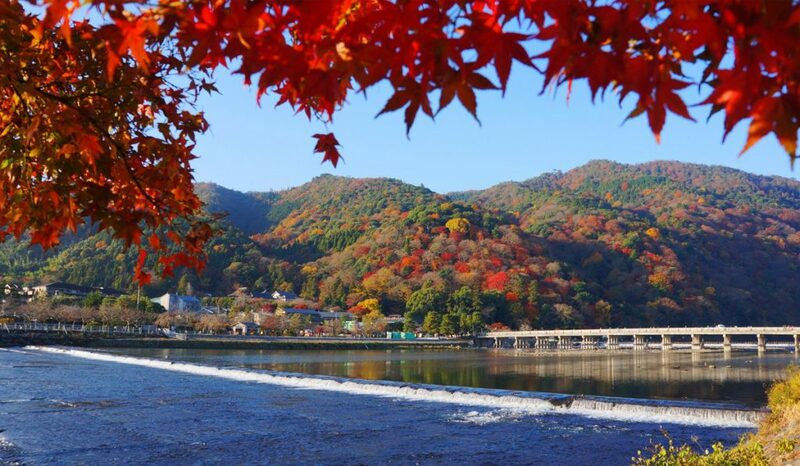 Korankei Valley in Aichi prefecture is one of the most beautiful places to view the autumn leaves in the Chubu area. It is said that a priest planted the first maple tree in 1634 and many locals followed his action, planting over 4000 trees in the area. Nowadays, about 11 different kinds of maple trees can be found which all color brilliantly during the autumn. 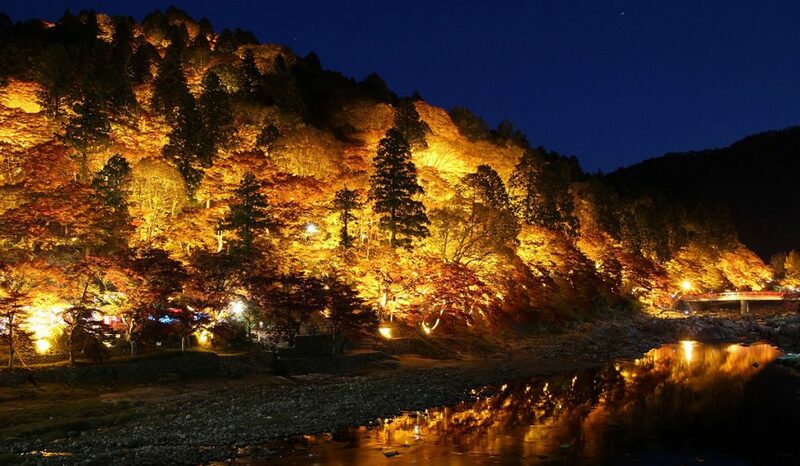 During the Korankei Maple Festival, special illumination can be enjoyed at night along the Tomoe River turning the area into a truly magical sight. During the festival people can enjoy many events such as Japanese drumming performances, local foods and tea parties. Easily accessible from downtown Tokyo in an hour is Mount Takao, which was included in the Michelin Green Guide of Must Go places. The close proximity to downtown Tokyo makes Mount Takao one of the most popular hiking destinations with 8 different hiking trails in different difficulties. 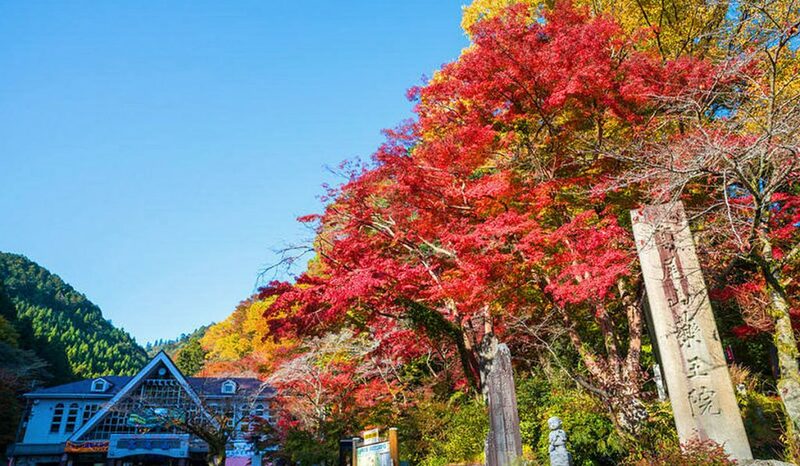 While climbing the 599 meter mountain, visitors can visit the many shrines and temples while enjoying the autumn foliage. If you’re lucky you might even encounter monkeys that inhabit the mountain forests. 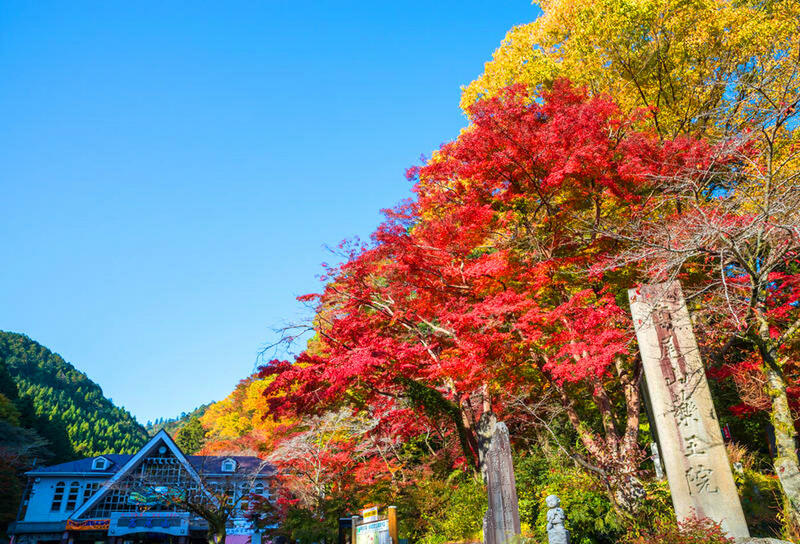 There’s no shortage of things to do on Mount Takao like riding the cable car, visiting a hot spring, sample the local food or spotting Mount Fuji in the distance on a clear day during autumn. You don’t always have to travel far away high up the mountains or traverse deep hidden valleys to find the best spots to view the autumn leaves in Japan. Some of the best spots are right here in Tokyo. And one of the most beautiful places is Icho Namiki, also known as Ginko Avenue. 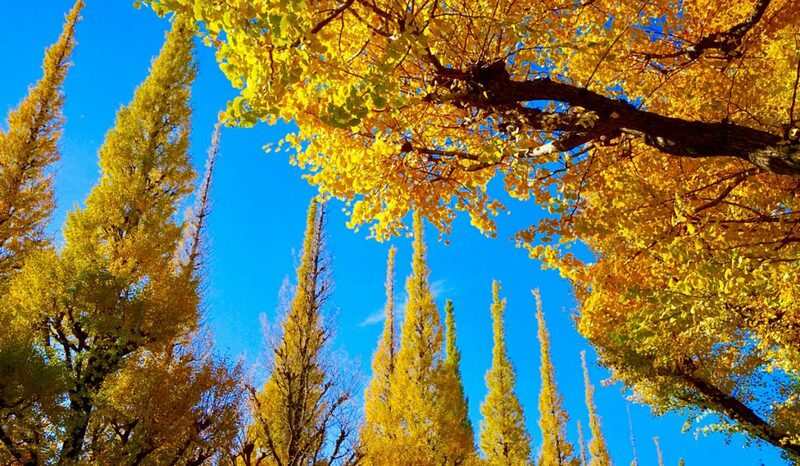 During autumn, the leaves of the ginko tree turn a bright golden yellow, turning the 300 meter avenue into a golden spectacle that attracts many admirers and TV reporters every year. Go during the peak season and join the festivities of the Icho Matsuri (ginko tree festival). There is a place in northern Japan which has thick luscious vegetation, pristine icy waters and glorious waterfalls so beautiful it should hidden away in a treasure chest. 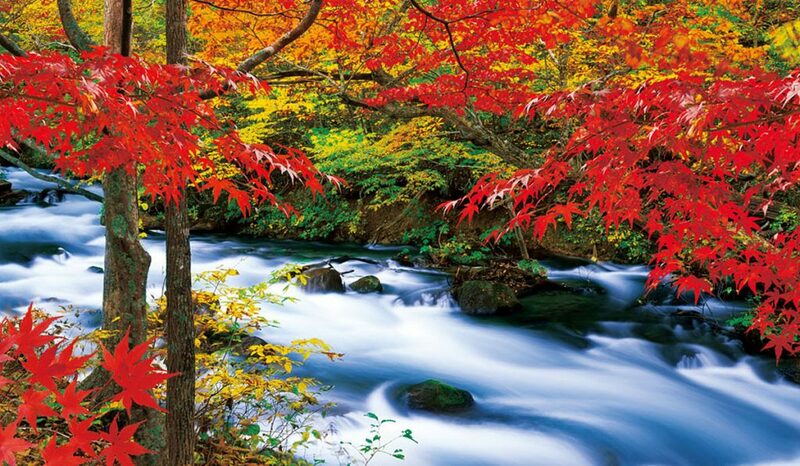 That’s the Oirase Gorge in Aomori prefecture, one of the most beautiful river valleys in Japan. Crystal clear water flows abundantly as you can find streams and waterfalls around every turn gushing through the vegetation. There are well-marked hiking trails for visitors to follow and no matter what season you visit, Oirase Gorge never fails to impress. 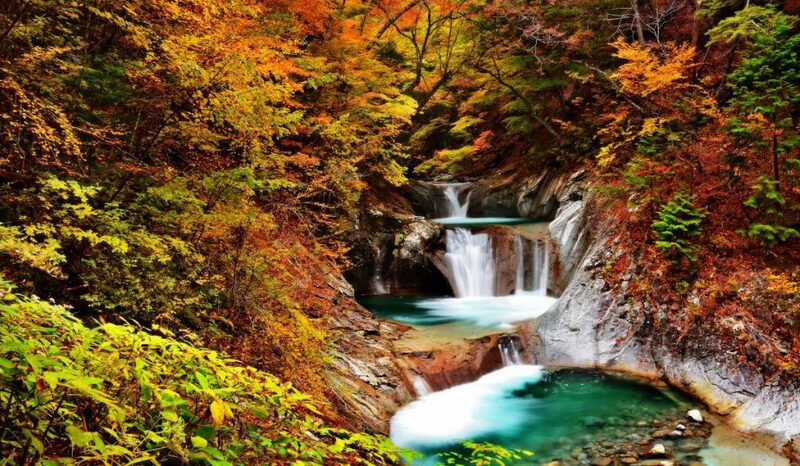 But once a year during the peak of autumn leaf season, does this place transform into a truly stunning sight of colorful leaves and waterfalls. 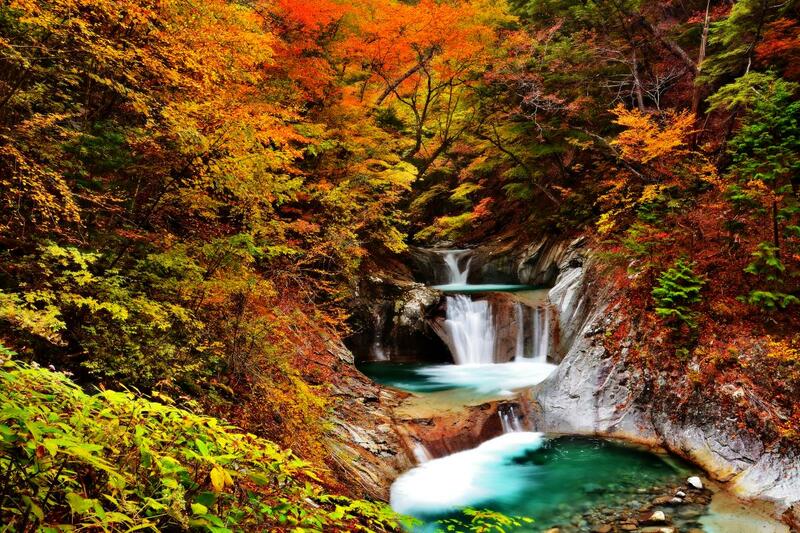 Within the Northern Japan Alps you’ll find the Kurobe Gorge, one of the most scenic spots for autumn leaf viewing in Japan. 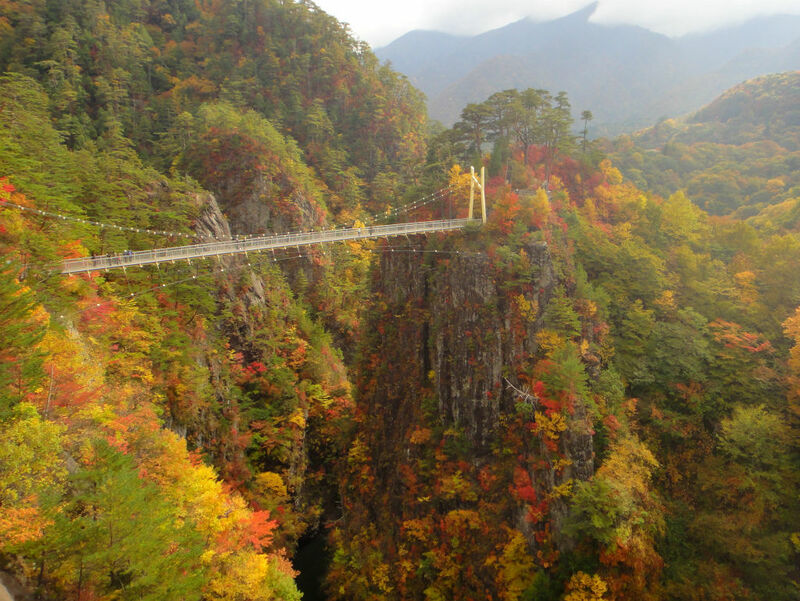 The Kurobe Gorge is one of the steepest gorges and makes for a spectacular setting when autumn comes turning the area into an explosion of colors. 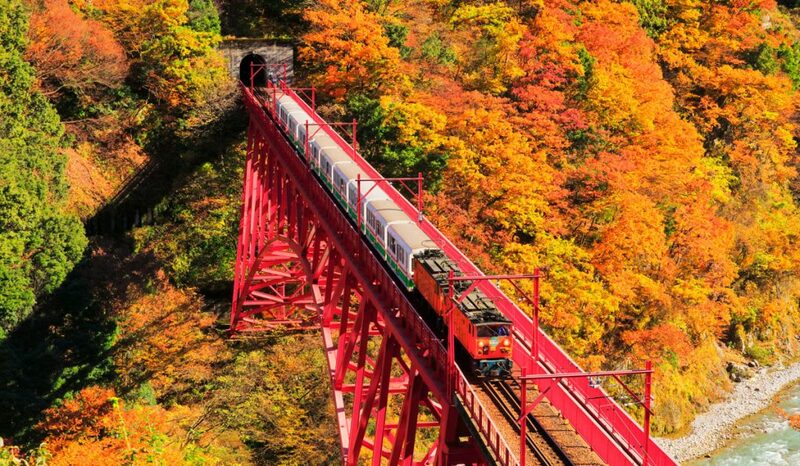 For a unique viewing experience, board the Kurobe Gorge Railway sightseeing train and be in awe as the train snakes through the mountains and passing one of the highlights, the iconic red Shin-Yamabiko Bridge. The changing of the leaves not only signals the coming of autumn, but also marks the start of many autumn related festivals and the availability of seasonal produce. And what better way to enjoy these than with with a beautiful view of Japanese ‘koyo’. Check the JR autumn leave forecast for 2018 here. If you have any other spots you think we should’ve added, tell us about it on our Facebook group. Are you following us on Facebook, Instagram, Twitter, and Pinterest yet, if not, be sure to subscribe for more fun things about Japan!